Starlight Stables - Books 1 - 6 available now! 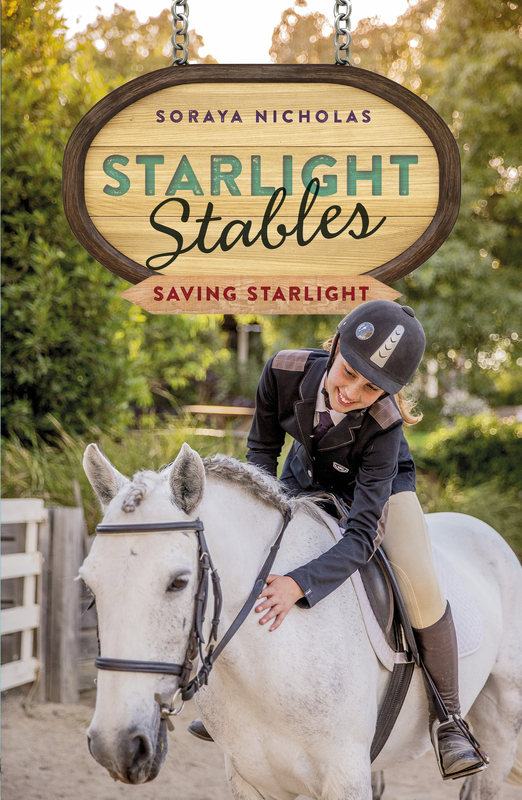 Poppy is thrilled to be back doing the one thing she loves – riding horses at Starlight Stables – especially when her aunt and uncle make all her dreams come true with a gift of her very own horse. But there's a catch... Poppy must look after the new scholarship girls. Will the bold and troublesome Milly and shy, sensible Katie be the pony-mad friends she's always hoped for? Available throughout Australia & New Zealand where all good books are sold! Or to order on-line, try Book Depository, Dymocks Australia, Angus Robertson, Whitcoulls, or The Children's Bookshop. Horse-mad friends Poppy, Milly and Katie are overjoyed to be back at Starlight Stables and spending every second with their new ponies - riding, training and having fun while preparing for their first big Pony Club competition. But when a rival competitor arrives one day to train with them, trouble seems to seek the girls out at every turn. Is it just coincidence? Or is someone trying to sabotage the three friends' chances of winning? Can Poppy, Mily and Katie expose their rival's risky antics in time to save their chances at the gymkhana? An exciting and enjoyable Australian series about the friendships and adventures of three horse-crazy girls. Available throughout Australia & New Zealand where all good books are sold! Or to order on-line, try Book Depository for free world-wide shipping, Dymocks Australia, Angus Robertson, Whitcoulls or The Children's Bookshop. Poppy is thrilled that her best friend Sarah is finally coming to visit Starlight Stables. She is sure that Sarah will love it as much as she does - especially Poppy's beautiful pony, Crystal, and her horse-mad friends, fiery Milly and sweet Katie. But it soon becomes clear that Sarah doesn't share Poppy's love of horses and riding - in fact, she's more interested in helping Poppy's uncle with some bushfire-injured animals. Poppy's world is falling apart. Her aunt and uncle have had an ominous visit from the bank because they have lost an important riding sponsor. It means they might have to sell Starlight Stables. Could Poppy lose everything - her beloved Starlight Stables, her beautiful horse Crystal, her friends Milly and Katie, and even her aunt's Olympic dreams? When Poppy buys a wild, beautiful brumby at an auction she doesn’t think about the consequences. Everyone thinks she’s crazy trying to take on a wild horse,­ although Poppy is sure she can help him. But Poppy had no idea how difficult a wild brumby would be to handle, and she’s heartbroken when he bares his teeth at her whenever she tries to go near him. Can she prove them wrong and work out how to bond with her brumby, or has she finally bitten off more than she can handle? Poppy, Milly and Katie are thrilled when they find out they’re off to Barmah National Park on a five-day trail ride! Visiting Storm’s home country, camping out, sighting brumbies in the wild and getting lost are just some of the adventures the girls have to look forward to. But will their penchant for landing in hot water lose them the chance of a lifetime?